This article is about the suburb. For the abolished electorate, see Grey Lynn (New Zealand electorate). Grey Lynn is an inner residential suburb of Auckland City, New Zealand, located 3 kilometres (1.9 mi) to the west of the city centre. Originally a separate borough, Grey Lynn amalgamated with Auckland City in 1914. Grey Lynn is centred on Grey Lynn Park, which was not part of the original subdivision of 1883, since the land was too steep and too wet for house construction. In 1914 the land was drained and levelled for playing fields. The park is home to the annual Grey Lynn Park Festival, which attracts around 100,000 visitors on the third Saturday in November. The character of the area is often seen as "arty", and one of being a "traditional home to free-thinkers and anti-establishment types". Grey Lynn takes the first part of its name from Sir George Grey (14 April 1812 – 19 September 1898), Governor of South Australia, twice Governor of New Zealand, Governor of Cape Colony (South Africa), Premier of New Zealand, and (towards the end of his life), Member of Parliament for Auckland West. Grey's service as MP for the area was apparently widely appreciated, since following his retirement from politics and death in 1898 the north-western portion of the suburb of Newton was renamed Grey Lynn in his honour. The original subdivision was 900 acres (3.6 km2), which is still the formal extent of Grey Lynn. Most of the houses were built between the 1880s and the beginning of the First World War of 1914-1918. Very few of the houses have been completely replaced by new structures. Williamson Avenue and Crummer Road are two of the major streets in Grey Lynn. James Williamson and Thomas Crummer jointly owned a farm in the area. In 1883 Williamson and Crummer sold the property to the Auckland Agricultural Company. The Surrey Hills farm was subdivided into 272 building sections to form the neighbourhood between Surrey Crescent and the southern end of Ponsonby Road. Shops are located at the intersection of Great North Road and Williamson Avenue. Most of the houses in the area were built between the 1890s and the beginning of the First World War. They were constructed quickly and with little variation in layout. Their façades were differentiated by the application of mass-produced items; wooden fretwork, stained-glass panels, turned balusters and pressed tin (intended for interior ceilings - this "new" product occasionally appears on the gable ends of some villas). The most important feature was the bay window—hence the name "Bay Villa"—an important feature which marked the owner as middle class. The new inhabitants tended to be young couples, mostly white-collar workers such as clerks and office workers, teachers or skilled crafts-people. The adjacent area north of Richmond Road was probably similar. [original research?] This was different from the nearby working-class area of Freeman's Bay or from the upper-middle-class area of Herne Bay. By the 1930s and 1940s the original owners were beginning to age and the fussily detailed houses of Grey Lynn on their cramped sections were seen[by whom?] as very old-fashioned and undesirable. The increased ownership of motorcars meant suburban development was expanding exponentially, resulting in the mid-20th century ideal of the quarter-acre section. All the inner suburbs of Auckland became less desirable, and areas like Grey Lynn became very rundown. Many properties became owned by people who lived elsewhere and were often divided into flats or operated as boarding houses. Repairs were kept[by whom?] to a minimum and in some cases houses were not repainted for almost half a century. The fact that so many houses of this period still stand today despite the depredations of fire, rot and borer is an indication of how well they were built. By the 1950s the very low rents in places like Grey Lynn and Ponsonby attracted students and immigrant workers from the Pacific Islands. By the 1960s Grey Lynn had developed a definite Polynesian flavour. Although in recent years this has greatly diminished, there are still a large number of Tongan and Samoan churches in the area. The 1970s saw a renewed interest in older Victorian properties, and from that period onwards many young professionals began buying dilapidated kauri villas in areas like Grey Lynn and renovating them. From the early 1990s this gentrification began to visibly change the area, resulting in an increase in house prices and in higher rents. Major corporate projects have gradually replaced lower-end retail enterprises. [not in citation given] An influx of middle-class people has resulted in a reduction of student flats and the slow but steady displacement of Polynesian families. A number of recent[when?] housing developments in the suburb have attracted controversy for their perceived contribution to the area's increasing population density. Grey Lynn had a local government like other suburbs of Auckland at that time. The local government was called Grey Lynn Borough Council, which started in 1885 and in 1914 merged into Auckland City Council and then merged into Auckland Council in 2010. 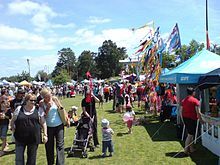 The Grey Lynn Park Festival has been held in early summer in Grey Lynn Park since 1984, and celebrated its 25th anniversary in 2009. It is the last independent community event in the city. The event, which attracts on average 100,000 visitors each year, is organised by four people who raise money from stall fees and charitable grants. It started as a local community get-together with working-class and Pasifika roots, though the appeal has broadened through the decades. Local band Unity Pacific first performed at the festival in 1987, and have appeared many times since. They headlined in 2009. Secondary schools serving the area include Auckland Girls Grammar School, Mount Albert Grammar School, and Western Springs College. Primary schools serving the area include Grey Lynn School, Richmond Road School, Westmere School, and St Joseph's School. Grey Lynn Park is the home ground of the Richmond Rovers rugby league club. The suburb is served by public transport. It lies within walking distance of the central business district via Ponsonby. Buses run down Great North Road, Richmond Road, Surrey Crescent and Williamson Avenue. Grey Lynn Fire Station: The former Borough Council Chambers and Fire Station. This building is distinguished by a wooden spire (recently restored) which originally housed the fire bell. Standing at the Ponsonby Road end of Williamson Avenue, this brick building dates from 1889, was designed by John Mitchell. It resembles many American fire stations of the period. The upstairs was used as the Borough Council Chamber until the suburb was amalgamated with Auckland City in 1914. Former Auckland Savings Bank: Located on Ponsonby Road near the intersection with Karangahape Road. This italianate building was designed in 1885 by Edward Bartley - originally a single story building it received a second story designed by the same architect in 1900. The former banking chamber is distinguished by the use of New Zealand marble. In the 1920s the lower part of the room was lined with panelling made of Cloudy Bay Marble from Nelson. Currently occupied by an Art Gallery. Allendale House: At the corner of Crummer Road and Ponsonby Road stands the large 1890s Italianate Mansion of George Allen, a saddle and harness maker. "Allendale" is a local landmark, having been successively a doctor's surgery, Maori girls hostel, boarding house, refuge for alcoholic men, and a restaurant. In the 1990s it was purchased by the ASB Community Trust as its headquarters and restored. Carlile House: A large Italianate building at 84 Richmond Road. Built in 1886 as an industrial school named the Costley Training Institute as part of the bequest of Edward Costley who left money for several Auckland charities. Owned by the adjacent church, it is now in poor condition and vandalised. The original stables are still visible on the Chamberlain Street side. Grey Lynn Public Library: Located at the Surrey Crescent shop at 474 Great North Road. This Neo-Georgian building was designed by architect William Gummer, and was opened in December 1924 by the then Mayor Sir James Gunson. It continues to be used as a public library and community hall today, and the inside now includes murals painted by artist Murray Grimsdale. Former Cameo Cinema: Located at the Surrey Crescent shops this Art-Deco building has been subdivided into several spaces and is occupied by a variety of businesses. The arched entrance is still a feature of the streetscape facing down Great North Road towards Western Springs. St Joseph's Church: Located on the Great North Road at Surrey Crescent. This modernist Roman Catholic Church from 1958 was designed by Guy Chambers and is distinguished by stained glass windows by Milan Mrkusich. St Joseph's Convent: Adjacent to the church on Great North Road is a school with modern buildings. One building is the former Convent built in the 1920s to replace an earlier wooden structure which burnt down. It is currently used as a hostel. ^ a b "Grey Lynn — an exclusive extract". The New Zealand Herald. 3 February 2007. Retrieved 2 October 2011. ^ Morris, Bruce (11 September 2010). "Gentrified Auckland suburb's time to shine". The New Zealand Herald. ^ "Diary Date: Grey Lynn Festival - 30 November" (PDF). Grey Lynn Festival official website/Ponsonby News. November 2013. Retrieved 26 October 2014. ^ a b Rein, Jocelyn (27 November 2009). "Grey Lynn festival turns 25". Auckland City Harbour News. Retrieved 2 October 2011. ^ Osmond, Bernard (28 November 2005). "Wet fields stop Grey Lynn party". The New Zealand Herald. Retrieved 2 October 2011. ^ "Grey Lynn festival celebrates 25 years". One News. 28 November 2009. Retrieved 2 October 2011. ^ "Papers Past — New Zealand Herald — 15 December 1924 — NEW BRANCH LIBRARY". Paperspast.natlib.govt.nz. 15 December 1924. Retrieved 4 April 2016. The Heart of Colonial Auckland, 1865–1910. Terence Hodgson. Random Century NZ Ltd 1992. Decently And In Order, The Centennial History of the Auckland City Council. G.W.A Bush. Collins 1971. Auckland Through A Victorian Lens. William Main. Millwood Press 1977. Ponsonby Heritage Walks. Tania Mace. Ponsonby Road Productions 2005. Wikimedia Commons has media related to Grey Lynn. Photographs of Grey Lynn held in Auckland Libraries' heritage collections. This page was last edited on 16 January 2019, at 19:10 (UTC).